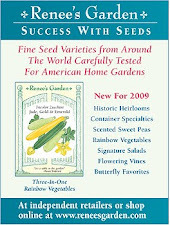 The seeds from Renee's Garden for the seed GROW project have started landing in mailboxes. While the first post isn't due until April several of the participating garden bloggers are getting a head start. I'll update this post with links to the blog posts of everyone sowing this month. Don't forget to add the signature line to your posts so that I can collect them through Google Alerts. Feel free to drop a link to your monthly post in the comments below. Visit as many these blogs as you can every month to see how your fellow garden bloggers are doing. I'll be posting two links; a direct link to your post and a link to your blog. I will also share some links to your posts on Twitter & Facebook. The Garden of James~ Sunny Day/Renee's Garden. Cheesehead Gardening~ My seeds have arrived for the GROW project. The Running Garlic~22 days till Spring. Jenn's Gardening Spot~ GROW project and Renee's Garden. Creative Country Mom~ It feels good to get my hands dirty. Yard is Green~ the GROW project. Happy Hobby Habit ~ The Grow Project. 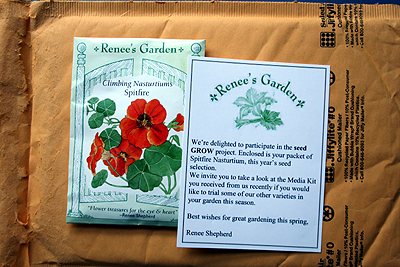 Garden Faerie~ Seed GROW project: Winter Sowing Nasturtiums. Brown Thumb Mama~ The Seed Grow Project Begins. Terra Mirabilis~ Growing nasturtiums with the GROW project, first report. & March Report. Life on the Balcony~How to Grow Nasturtiums in a container. K-Town Homestead~Piquant pickle plans for 2010. True Epicure~GROW Little Seed, Grow. My name is Brooke, I am zone 6, So. Indiana. My garden is 3 years old, and I have a definate country style with heirloom plantings. Look forward to meeting everyone and enjoying our plants this year! Oops, I assumed google alert would pick up my post, but must not have. My first post is up too! Sorry for the delay in adding the links. For some reason Blogger isn't sending me notifications about the comments. The seed Grow project info page and one of the e-mails we were sent have the signature line slightly differently than it is above (just a comma and a period different), so the Google alert might not be catching all of them, depending on from where people copied the line? Hey all! I've not posted about "The Experiment" yet, but with all the snow melted, it won't be long now! I'll be checkin in on y'all from time to time. I finally posted! As I noted at http://tr.im/Sbq8, I should have posted on March 1, but life got in the way. Anyway, the seedlings are up. Hooray! I might be planting these indoors soon. We're in a tiny bit of a warm spell at the moment (warm being relative), but I don't trust it. Sure we'll get some more snow soon enough. I'll be sure to blog about it by April, though. I am excited! Um, accidentally deleted my post, but it basically said "I planted some seeds in a wintersow container and then I planted some other ones in cells and put them on the seed starting table." I'm sure the actual appearance of green will inspire me to more elegance, if not verbiage. Got little green things up there this week. Will attempt to not delete the post this time. I'll put my April one up tomorrow. Thanks again for spearheading this project. It's so much fun to know people all over the country are doing the same thing. I added yours. Sorry I didn't catch them before. I got my April post up last night. I also did a post in March, but it was toward the end of the month. Looking forward to checking in on all my fellow spitfires growers.